Root Cellar Members! Tired of sticking on those Hello labels? Design your own badge. 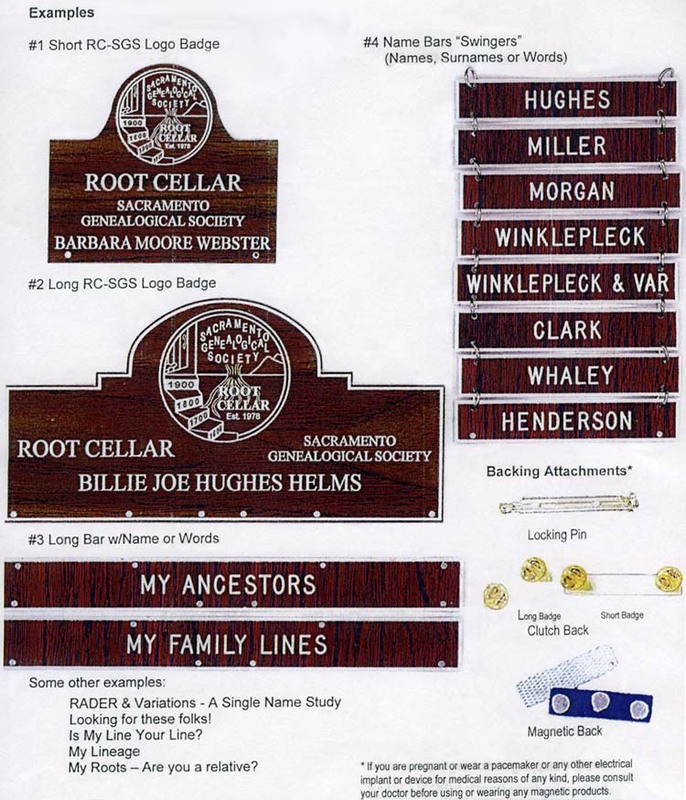 Choose from two engraved plastic name badge styles. Then, to attract the attention of potential distant relations at our meetings, add some ancestral name hangers. The badge has three different attachment options – locking pin, clutch pin and magnetic strip. The first two will poke a hole in your shirt. The magnetic one will not. But if you are pregnant, wear a pacemaker or any other electrical implant or device for medical reasons of any kind, please consult your doctor before using or wearing any magnetic products. To place an order, download and print the badge order form. Root Cellar then submits your order form with payment to the badge vendor. Since the vendor requires a minimum amount of $25, there may be some delay in the submission of your order while waiting for a sufficient number of additional orders required to reach that amount. You will be notified when your order is ready. You can pick up your badge at a meeting or ask a friend to do it for you. For questions about the status of your order, email Root Cellar at info@rootcellar.org. Note: Due to the new sales tax colletion decision by the U.S. Supreme Court, Root Cellar can no longer sell to cutomers from outside of California.